Edible white fleshed, mildly sweet fruit with crunchy black seeds develop from the large ornate, creamy white, nocturnal flowers that bloom and last only one night. Foggy blue colored columns can grow to epic cactus proportions of up to 80 feet tall and with multiple, upright, columnar branches from the self supporting base, can reach equally as large diameters on the entire plant. 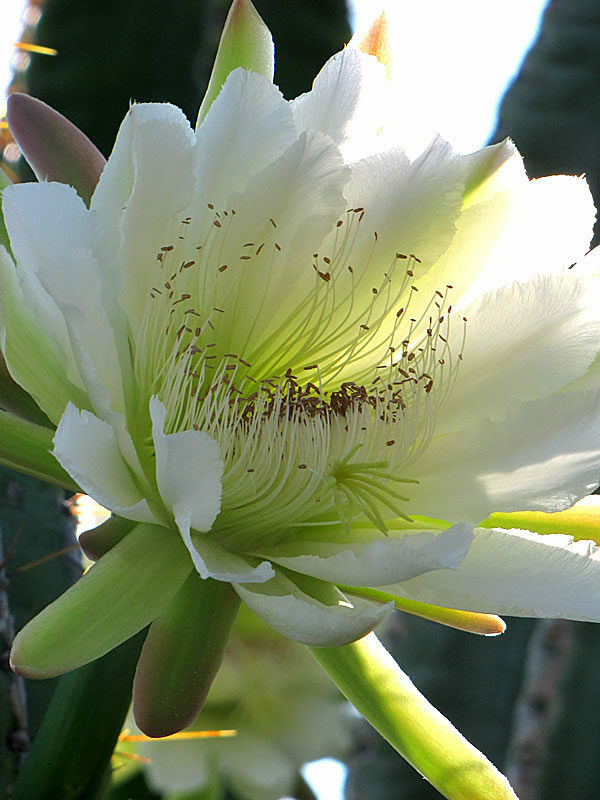 Organpipe Apple Cactus (cereus peruvianus) – Edible white fleshed, mildly sweet fruit with crunchy black seeds develop from the large ornate, creamy white, nocturnal flowers that bloom and last only one night. 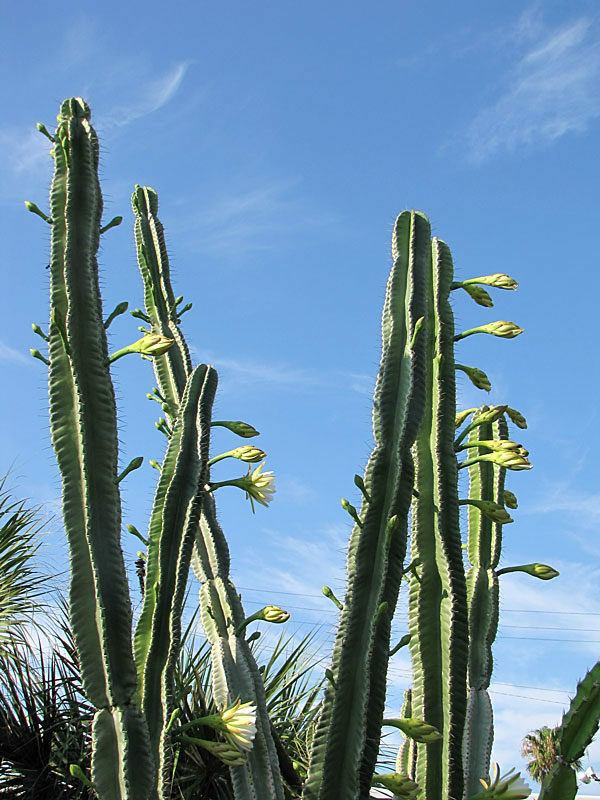 Foggy blue colored columns can grow to epic cactus proportions of up to 80 feet tall and with multiple, upright, columnar branches from the self supporting base, can reach equally as large diameters on the entire plant. The growth rate of Organpipe Apple will vary greatly depending on soil type, sunlight, temperature and other factors. A few leaves are often trimmed prior to shipping to reduce transpiration and travel stress. 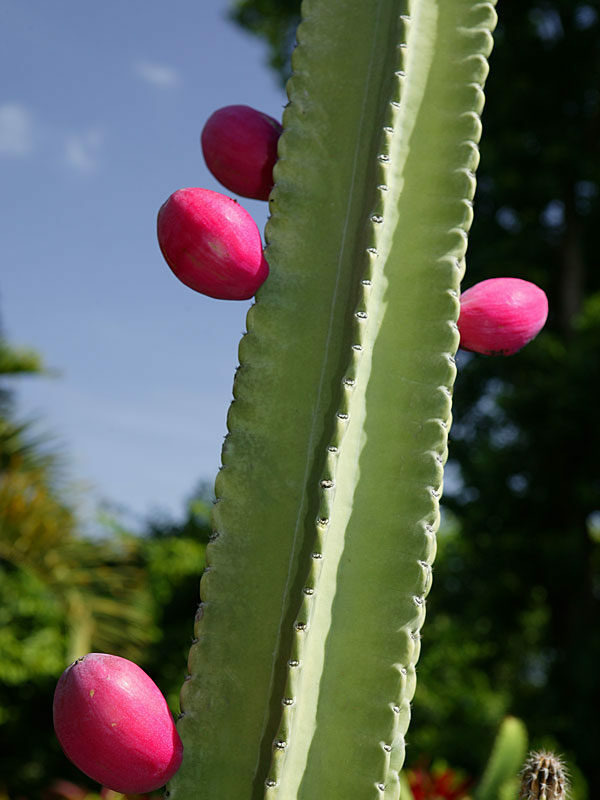 Organpipe Apple Cactus enjoy a well drained, organic cactus mix easily found at your local box store. Remember try to stay away from wet or mucky soils. 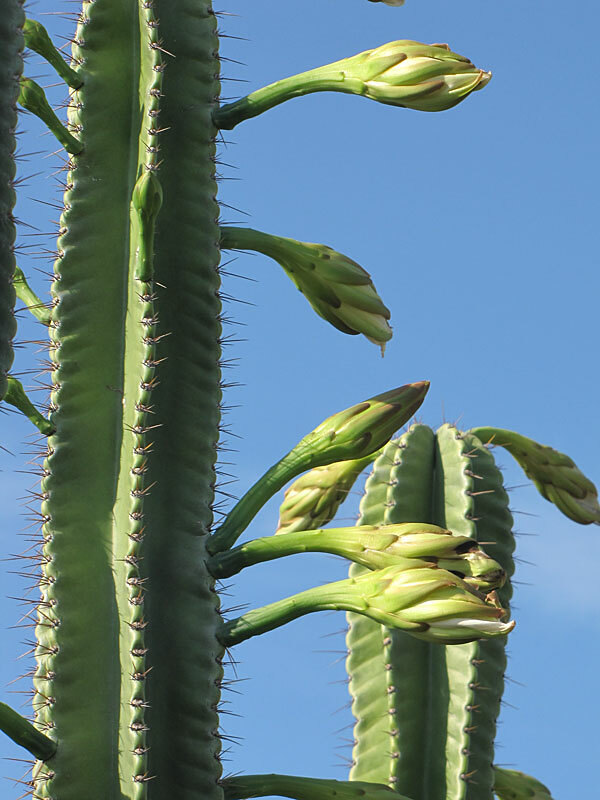 To help establish your new Organpipe Apple Cactus, fertilize sparingly a few inches away from the base, tri-annually with a slow time released product. Unfertilized they will tend to grow at a slower pace. Note: The heavy salts in cheaper fertilizers will damage the roots and possibly kill the plant. Its best to use a brand you know and trust. Best outdoors if grown in zone 9b-11, find your zone here. This Cactus requires 80-100% sunlight. Depending on your location full sun is often best. 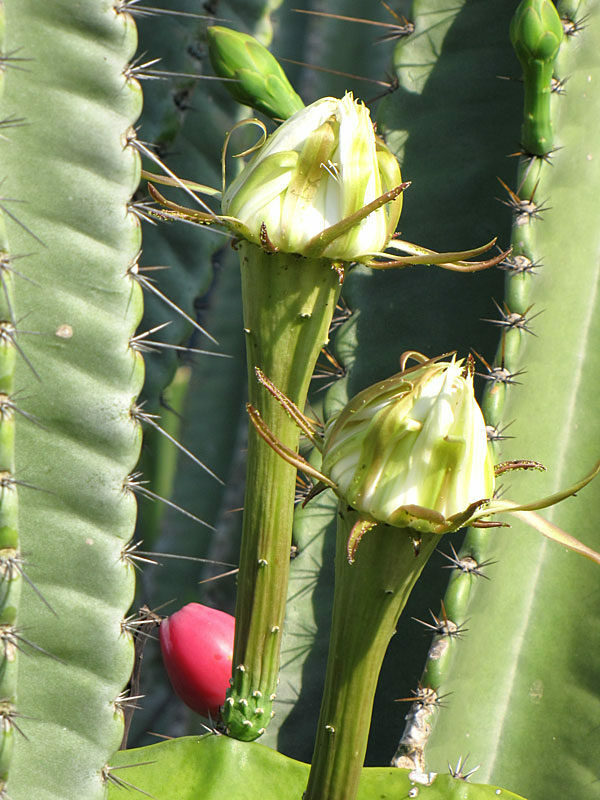 In the northern end of their grow zone Organpipe Apple Cactus should be brought indoors or protected during the winter months. The patio zone is 4b-11 which means the potted plant will flourish over the summer months in colder zones but must be brought inside before winter. 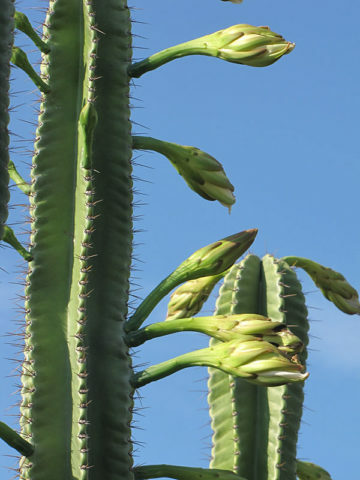 All Organpipe Apple Cactus for sale will vary in size. In the spring, plants are often smaller than plants shipped in the fall. Plants designated with a sku ending in -4, -6 or -8 will arrive in a standard 4 inch, 6 inch or 8 inch round growers pot respectively. Our new, reusable, recyclable deep plugs are 7 or 9 inches deep and 2 or 2.5 inches in width. Products growing in these pots are easy to transplant and allow for deeper roots and faster growth, they are designated with a sku ending in -7 or -9. (Note: The item sku number can be found just below the buy button.) The color and style of these pots may vary. If we are out of a particular size item, we may ship a larger size at no additional charge. For more information, click the “best packaging” link at the bottom of this page. 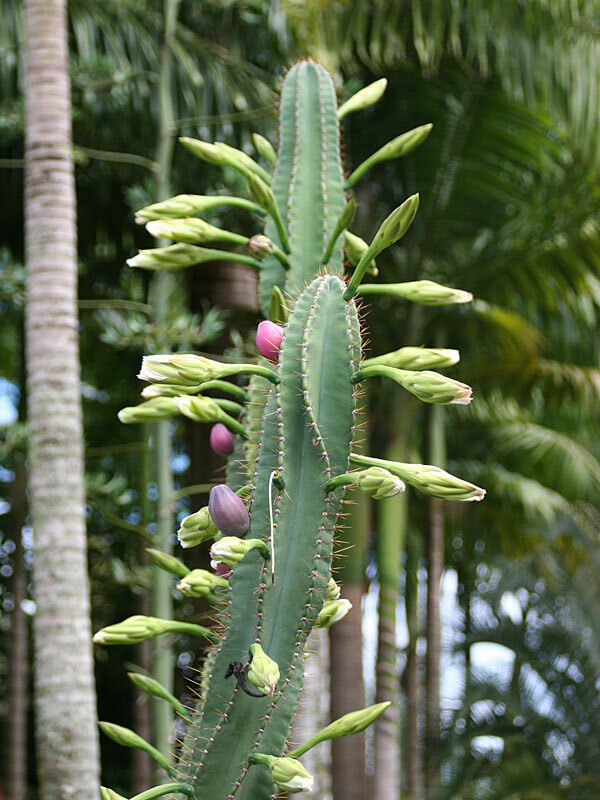 Note: Before leaving, Cactus are inspected, watered, and pruned. Larger plants, generally those that ship in 8″ pots, will be topped to 36″ or 48″ overall, depending on the variety, if necessary, to facilitate shipping. Your new plants’ pot is then bagged to ensure that the soil stays in the pot and not loose in the box. Plants are tissue or kraft paper wrapped and generally secured in place with natural biodegradable peanuts. 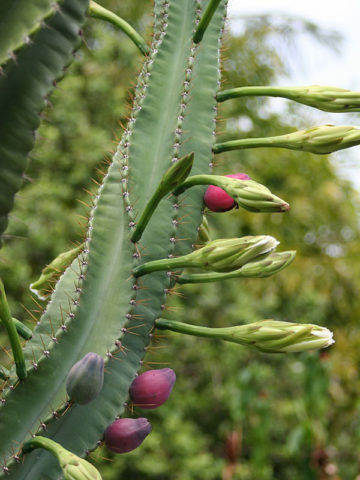 You may want to order your Organpipe Apple Cactus (cereus peruvianus) online now while they are in stock, supplies are limited.